When I first made macarons 10 years ago I didn’t have almond meal but I had ground walnuts. I used walnut meal to make my very first macarons. Cookies were delicious. I know true French Macarons are made with fine almond meal and since then I also tried ground almonds and today I’m experimenting again, using hazelnut flour to make these delicate meringue cookies. Sift hazelnut flour into a bowl, sift in powdered sugar. Sift together 3 times. Set aside. Beat room temperature egg whites with a pinch of salt, beat until soft peaks are formed, then gradually add granulated sugar, beat until stiff peaks are formed. Pour batter into a piping bag fitted with a round tip. If using a template place the template under the parchment and pipe the mounts of batter onto the baking sheet lined with parchment. Remove the template from underneath. Tap baking sheet with unbaked shells 2 times on each side. This step helps to remove air pockets in the batter. If you still see air bubbles on the surface of your macarons, take a toothpick and pop them. 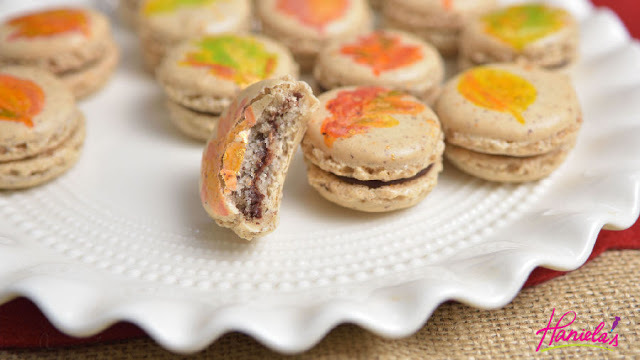 Let macaron shells crust for about an hour, or until no longer sticky. This highly depends on the humidity in your area. Macarons are known for their signature feet, this steps helps to ensure that they will not spread in the oven instead they will rise up developing the feet. Bake at 300F for 18-22 minutes. Let cool. Peel from the parchment and store in an airtight container until ready to fill. Try not to underbake as cookies will stick to your parchment paper. Pour boiling hot heavy cream over chopped chocolate( or use chocolate chips), let sit for 5 minutes. Whisk until smooth. Let cool slightly. Whisk in raspberry swirl. Chill until ganache thickens. Fill the piping bag with the filling. Sandwich cookies together. Take care not to press the shells in the middle when sandwiching cookies together. Store in an airtight container in the refrigerator for up to a week or so. I find these delicate cookies taste their best when left to rest for a day or 2. I decided to paint macarons to make them more festive for upcoming Fall Holidays. I used food colors mixed with a little bit of extract and a food only paint brush. 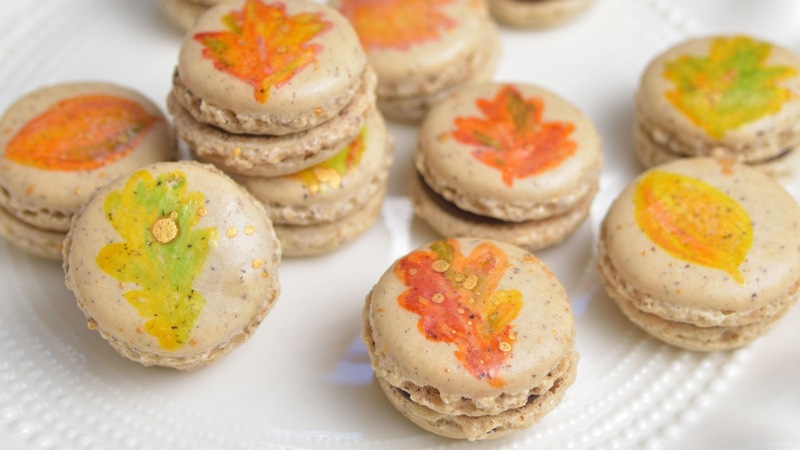 Then I mixed some food grade gold luster( get it here or here) dust with extract, I dipped food only paint brush into the mixture, holding brush just above the macarons I tapped the handle to splatter some of the gold luster dust on the shells. I also made a video with step by step directions on how to make these beauties, enjoy.